I’m not feeling well today….have a headache and have been sneezing alot. Don’t know if it’s related to the pregnancy, a change in cold to warm weather, withdrawal from watching 24, or a new house with new germs. Who knows…..
Everyone keeps telling me to be prepared to spend more money on this little girl than I’ve spent combined on my two boys. I’ve not spent a penny so far but it’s only been six days since we found out. Fortunately, I have lots of friends with little girls who have offered to hand down plenty of cute pink clothes. It’s almost like having a first child all over again….not really, but kind of. 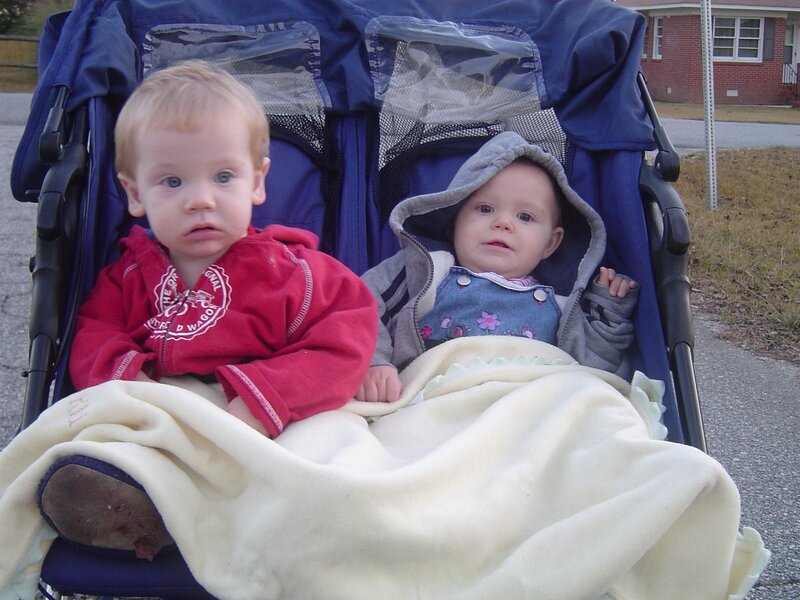 Here’s a picture of Luke strolling along with his cousin, Ella (Valerie and Tyler’s second daughter). Baby McGinnis is a boy or girl? 100% positive as the ultrasound pictures were VERY clear. There are boxes everywhere! We have officially made the move from one house to the next. We still don’t have our cable hooked up yet so we have a sweet friend taping 24 for us tonight. Since we don’t have our cable yet, we are also without Internet access….which is probably a good thing since it’s a distraction for me. I need to be spending what little time I have unpacking boxes and organizing rooms. My friend, Crissy, is a wonderful writer and extremely transparent in her words. She shoots straight from the heart. I wish everyone knew this friend of mine. She’s an amazing godly woman. Click on her name above to access her blog. It was pleasant yesterday….warmer than usual. We ventured outside for some play time. 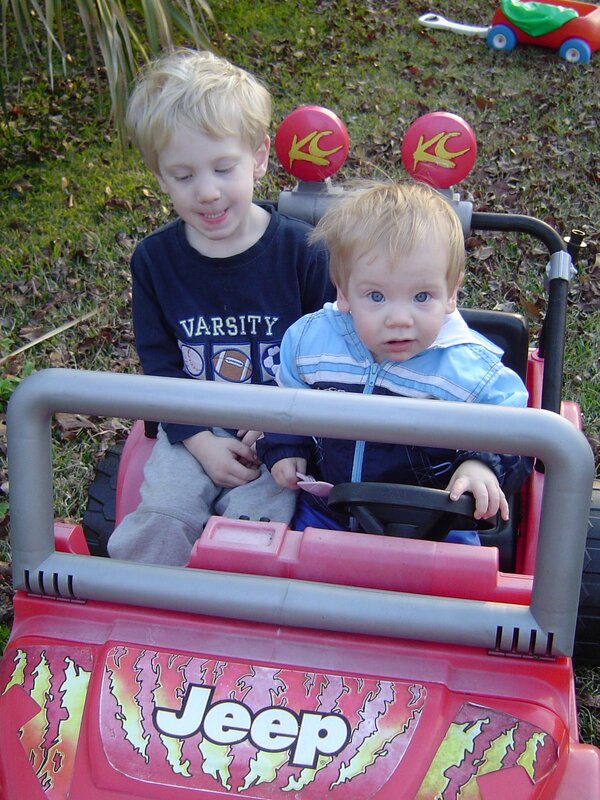 Luke decided it was his turn to take his older brother for a spin. I hate the moving process. Packing up so many boxes, not knowing where to put certain items, finding items you thought you lost, dusting in areas never gone before, deciding what to sell, keep, toss or give-away, wondering how you accumulated so much stuff (junk, actually), finding the time to get it all done, etc. AHHHHHHH! I hope we don’t do this again for a really long time. We went to Andrew’s class today to have a pizza party. 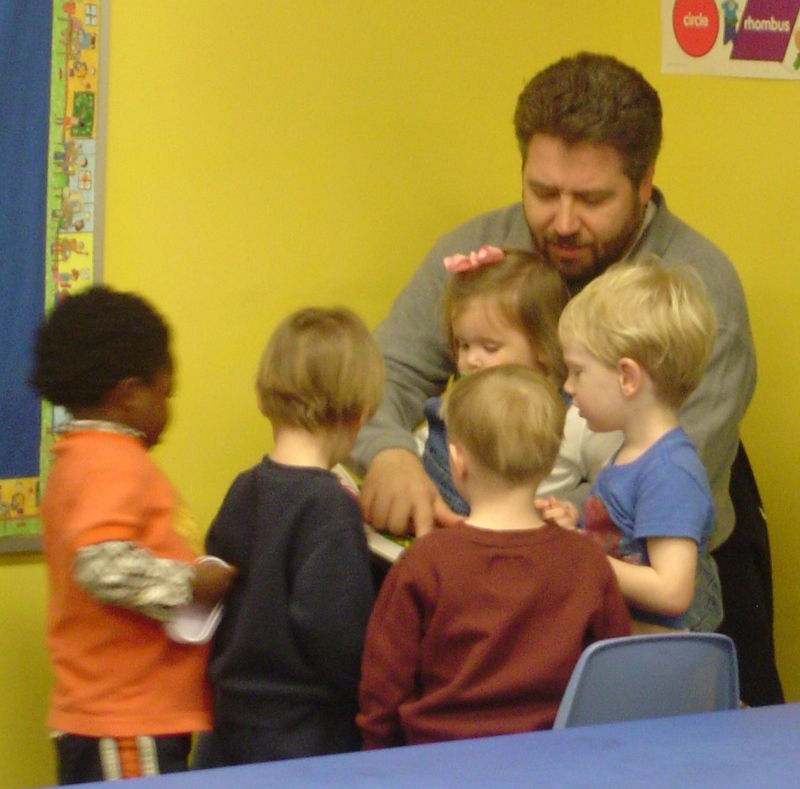 Afterwards, most of the kids gravitated toward Mitch because he had a book in his hand. I like this picture because Ansley, the only girl in the class of 12 boys, wanted to sit in Mitch’s lap. I think she loves books more than my own kids.